Nostalgia is a DS role playing game that hearkens back not only to when Final Fantasy VII's graphics were next-generation, but to an era of steam and airships that never quite existed. That's right – that thing I'm always going on about is the main selling point of this game: steampunk. Normally, this would be an automatic plus for me if the Victorian corsets are frilly and the airships are spectacular. However, my steampunk standards are high and as some games have proved, genre alone is not enough to sell a game. 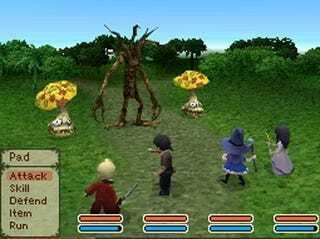 Nostalgia is a turn-based RPG that's been out in Japan for the last year or so. Players follow young Eddie, a budding airship pilot/adventurer who goes on a quest to become more of a badass and find his missing father. I played the demo level of the game twice on the noisy PAX expo floor. The game ships October 20. You Can't Fast-Forward Text: None of Nostalgia is voiced and there is a lot of reading to do. Rather than let the game decide how fast I can read, I would really rather just mash the A button to bring up all of the text in a text box at once and then mash it again to get rid of it. Bland Music and Scenery: With the exception of the air travel and most of the menus, the 3D visuals of the 19th Century steampunk world are little dull. London lacked anything resembling Jack the Ripper's era and Cairo was cramped and yellow. The music in the demo level didn't wow me, either – but do bear in mind the background noise of PAX might've had an impact on my auditory impressions. The Airships: Rather than just serving as a fancy mount, airships like Eddie's Maverick make up about half of the gameplay. While in the air and navigating the globe from London to Cairo, random encounters will occur where Eddie and his crew man battle stations on the airship to fight. Each character brings their specific skills to their station, like the mage character can charge up a canon attack, Eddie the melee character can ram the Maverick into an enemy, etc. Enemies can attack in the air from the front, the back or the sides of the airship and according to an Ignition rep, the difficulty level of the encounters changes depending on which of the three levels of altitude your ship is traveling. Aside from that, the ship is fully customizable when you shell out for parts and stuff at stores. The Overall Look: London and Cairo might've looked a little dull but the character models were so cute. Eddie almost looks like a baby Cloud from FFVII – and I don't think that's an accident. I'm told the dev team that worked on Nostalgia was responsible for bringing FF III and IV to the DS and I appreciate their sense of visual homage. The word nostalgia seldom goes with the word passion. At best, it inspires lukewarm, fuzzy feelings of half-remembered happy things. And for me, that just about sums this game up: I was never passionate about random encounters, but I get a little misty-eyed at the mention of turn-based combat.